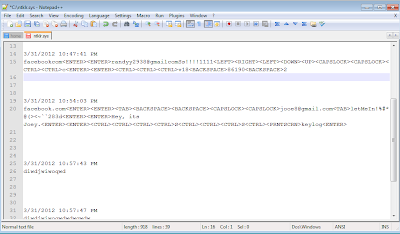 This is a basic keylogger I wrote in VB.NET a few months ago. 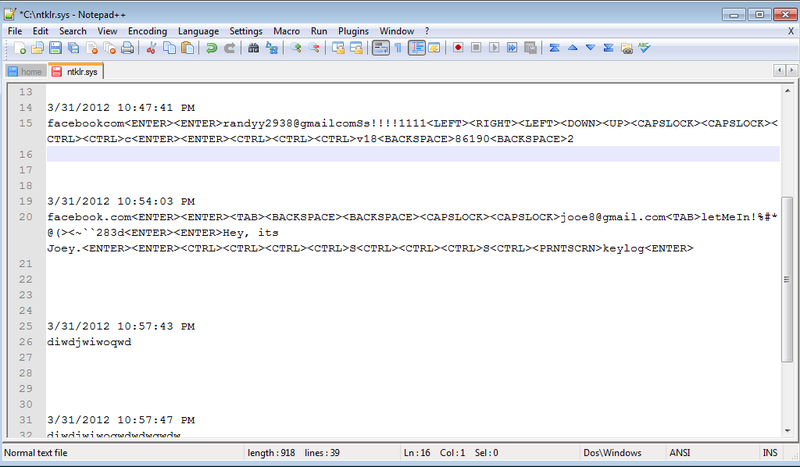 It can be hidden by pressing the key combination CTRL+SHIFT+S (pressing it will toggle the display of the keylogger control panel), and has an inconspicuous process name "svchost.exe" Upon exit, it will dump its keystroke log to C:\ntklr.sys and make the file hidden. If you do not have permission to write to that directory, or would like to save the log using a different file name, you can select a different directory and path after checking the "Write to file?" checkbox. This free, easy to use, and open source application does not raise any flags with popular anti-viruses as of right now, according to this report from VirusTotal, a service that scans a file through 40+ popular anti-virus products. Check the "Write to file?" checkbox and select a path (or use the default path), then click Open. Click the Start button to start keylogging. Press some keys, or wait for the victim to type something. Whenever you want, hit CTRL+SHIFT+S again to bring the window back and view the log. Exit the application or hit End to make it write the log to the log file you specified. 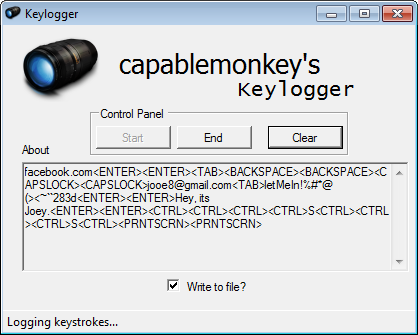 Open the logfile to view keystrokes. This file is hidden, so make sure you have Show hidden files enabled in Windows Explorer to find it. If you would like to improve or modify this application, feel free to use the provided source code! It requires the .NET Framework 4.0 redistributable package to be installed in order to run. Its look good really , i am begineer in vb.net , and using visual studio 2008 with .net frame work 2.0, OS Windows7 , is that any way to change some code for make it compatibe with .net 2.0 , sorry for any error from myside.thank u.
Wow nice article, now your article help me, to solve my problem, tn dude,, By the way I found this site online, same as your site, all about key logger http://www.alwysfree.blogspot.com I think its free, also included serial and crack. View this blog http://spying.ninja/ikeymonitor/to explore lots of useful articles on similar topics. Thank you for a cool application. But I prefer this software https://www.refog.com/keylogger/ .Cuz, It helps me ensure that I know exactly what's occurring on my device at all times. It`s very important for me. some solution to the keypad??? ?